Home to ancient civilizations and a diverse geography, Asia boasts a mind-boggling number of UNESCO World Heritage Sites. The Paris-based United Nations Educational Scientific and Cultural Organization has its hands full trying to preserve culturally significant sites throughout Asia. Choosing from the many World Heritage Sites in Asia can be daunting, but a few top UNESCO sites in Asia shine above the rest. So, grab your camera, pack extra energy, and get yourself to one or all of these fascinating places! Contrary to popular belief, the Great Wall of China actually isn't visible from space. Regardless, it is the longest man-made structure in the world and worth seeing when here on Earth. Legend holds that the original builders followed the tracks of a dragon to determine the path of the wall. The dragon did them no favors; more than a million workers perished during the construction, and the Mongols simply circumvented the wall and conquered China anyway! The Badaling section of the Great Wall -- only 40 miles northwest of Beijing -- is the busiest. Avoid the tourist masses by walking other sections of the Great Wall, which range from easy to extremely difficult. Read more about visiting the Great Wall of China. See some very interesting Great Wall of China Facts. The Taj Mahal was constructed with one material not found in many World Heritage Sites: love. India's most famous landmark was built by Emperor Shah Jahan in memory of his wife Mumtaz Mahal who died giving birth to their 14th child. The emperor was so stricken with grief, he was inspired to create what is widely considered the most beautiful structure in the world. Constructed in 1653 during the Mughal Empire, the Taj Mahal was inducted as one of the new Seven Wonders of the World in 2007. The white marble and intricately carved reliefs wet the eyes of nearly 4 million tourists a year. See the Taj Mahal for yourself by traveling to Agra, approximately 125 miles from Delhi. See 22 interesting Taj Mahal facts. Read this Taj Mahal travel guide. Getting around India can be hectic; see tips for transportation in India. Most popular of the top 10 things to see in China, the Forbidden City in Beijing was declared a UNESCO World Heritage Site in 1987. To call the Forbidden City sprawling is an understatement; 980 buildings encompassing 7.8 million square feet will test the stamina of any sightseer! More than a million workers began construction on the Forbidden City in 1406 and labored for 15 years to create a palace fit for the emperor and his concubines. After serving as home for 24 emperors, today the Forbidden City is one of the most unforgettable sites in all of Asia. Get the most out of your visit by reading this guide to the Forbidden City. Read about other UNESCO World Heritage Sites in China. Often mistaken as a single temple, Angkor is actually made up of hundreds of temple sites scattered across a 600-square-mile area in Cambodia. Only a few of the Angkor temples have been restored; meanwhile, the jungle quietly reclaims archaeological wonders and Buddha statues fit for museums. The vine-strangled bricks of Ta Prohm, one of the most iconic of the temples, served as the set for the movie Lara Croft: Tomb Raider. Constructed in the early 12th century, every inch of the Angkor temples are covered with detailed carvings depicting mysterious scenes -- everything an adventurous traveler wants to see in Southeast Asia! Angkor Wat, the epicenter of this UNESCO World Heritage Site, is just three miles from the tourist town of Siem Reap. See where is Angkor Wat? Read 20 interesting Angkor Wat facts before you go. See some Cambodia travel essentials and learn about visiting Angkor Wat. Explorers in the 16th century were so moved by Ayutthaya's size and influence that they referred to the city as the "Paris of Southeast Asia." Ayutthaya was the thriving capital of Siam -- modern day Thailand -- from 1351 to 1767. Despite being formidably surrounded by rivers on all sides, the ancient capital was finally sacked by Burmese invaders after many failed attempts. Once the city fell, a new capital was established an hour south: Bangkok. Today, visitors flock to this World Heritage Site to wander ruins that coexist side-by-side with a modern city. The premier attraction in Ayutthaya is the sandstone head of an ancient Buddha statue. A nearby tree grew around the statue, crushing the body to dust; however, the head was mysteriously spared and is now preserved inside of the tree! 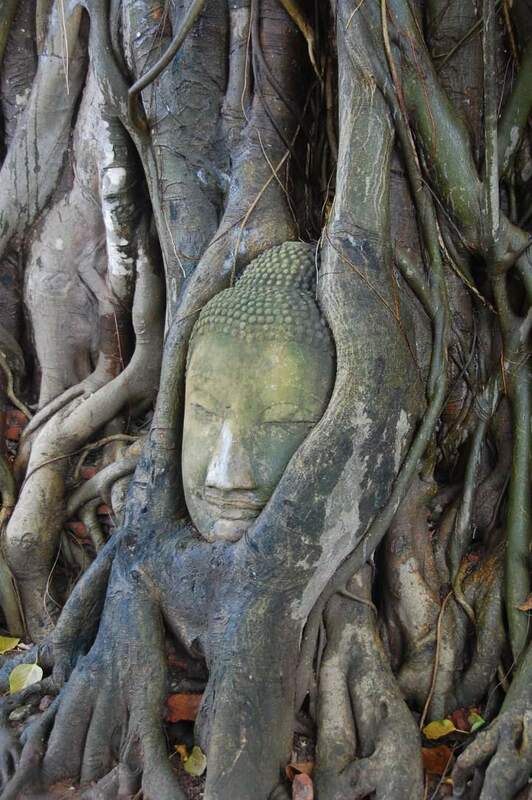 Read more about visiting Thailand's ancient capital: Ayutthaya. Find other great places to learn about Thai history.